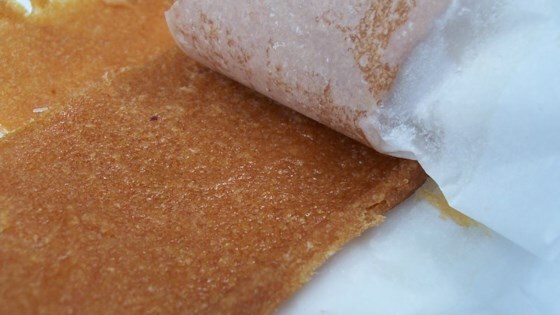 "Make your own fruit leather out of apples and pears, and enjoy it as a snack any time." Preheat the oven to 150 degrees F (65 degrees C). Cover a baking sheet with a layer of plastic wrap or parchment paper. In the container of a blender, combine the sugar, lemon juice, apple and pear. Cover and puree until smooth. Spread evenly on the prepared pan. Place the pan on the top rack of the oven. Bake for 5 to 6 hours, leaving the door to the oven partway open. Fruit is dry when the surface is no longer tacky and you can tear it like leather. Roll up on the plastic wrap and store in an airtight jar. I make this all the time for my daycare kids. In order it to work in a blender you must cook the apples first in about 1/4 cup of water until barley tender. Then puree in blender as directed. Instead of sugar I added a few tbsp of strawberry jam! It was delicious! !